The US has loads of interesting regional dishes. One of the best known is gumbo, a hearty stew-like dish with bottomless flavor. Gumbo originated in south Louisiana eons ago. Today it’s made with a wide variety of meat and seafoods, in both Cajun and Creole styles. It’s so popular (and the variations are so endless) that probably every family in Louisiana has their own unique recipe. All gumbos are based on a long-cooked roux (the flour-and-fat mixture that also forms the basis for many gravies). When we make gravy, we usually cook the roux for only a few minutes. For gumbo, we need to cook it for at least half an hour, and usually more like 45 to 60 minutes. It’s a bit of work, yes. But the flavor payoff is worth it. And that flavor is the essence of gumbo. Mardi Gras is coming up this Tuesday—and it’s the biggest celebration of the year in New Orleans. What better way to join in the festivities than by making a batch of gumbo for yourself? It’s like a party in a bowl. There aren’t many rules for making gumbo, though one informal one says it should contain either meat or seafood—you shouldn’t mix the two proteins together. But there’s an exception to every rule, and it’s common in New Orleans to find gumbos that combine seafood and sausage. In any case, we’re safe from the gumbo police because we’re not including seafood in this classic-style Chicken and Andouille Sausage Gumbo. Though I won’t tell if you decide to add some shrimp about ten minutes before you serve this dish (it’s a delicious addition). To make gumbo, you need to know about two main principles of Louisiana cooking. The first is the “trinity”—the mix of onion, celery, and green pepper that appears in numerous Cajun and Creole recipes. Cooks differ on their preferred proportions, but I like to use 1½ parts onion to 1 part each of celery and green pepper. The second thing you need to learn is how to make a Louisiana roux. This is an equal mix of fat and flour that’s cooked for a long time—at least half an hour, and often over an hour. The longer you cook it, the deeper brown it gets, and the better the flavor. And the better the gumbo! Although some cooks like to cook roux until it’s a dark mahogany, I suggest you cook it until it’s the shade of peanut butter. Less can go wrong this way, and the flavor is quite good. Besides, it’ll take less time. Speaking of time, this is a dish that takes a while to make. I suggest you set aside about 2 hours for the initial prep work (which includes cooking the roux). You’ll probably need only about an hour and a half, but you don’t want to feel pressured. After the prep work is done, the gumbo will take at least 2 hours to cook, although you can extend the cooking time another hour or so if you wish. This dish makes several quarts—which is enough to feed hordes (if you’re spending all that time making roux, you might as well cook up enough gumbo to make it worth your while). Leftovers freeze extremely well if stored in airtight containers. You can substitute a commercial mix if you prefer; see Notes. Prepare the Cajun spice mix. Combine all ingredients and mix well (I like to whirl them in a spice- or coffee-grinder). Place the Cajun mix in an airtight container and set aside (you’ll have more than you need for this recipe; see Notes). Cut the bacon slices across their width into strips of ½ inch or so. Place the bacon strips in a 6-quart Dutch oven or soup kettle. Turn the heat to medium and sauté the bacon until crisp and brown (10–15 minutes), stirring occasionally. Meanwhile, cut the boneless chicken thighs into pieces about 1 inch square. Season the chicken pieces with about 1 teaspoon of kosher salt, then set aside. Cut the Andouille sausage into chunks of about ½ inch, and set aside. Check on the bacon. It probably isn’t done yet—but if it is, delay Step 6 and proceed to Step 7. Prepare the “trinity” of onion, celery, and green pepper. Peel the onion(s) and cut into dice of about ½ inch. Wash, dry, trim, and peel the celery and cut into pieces of about ½ inch. Wash, dry, and core the green pepper. Cut into pieces of about ½ inch square. The Dutch oven/soup kettle should still have enough bacon fat to brown the chicken; if not, add a bit of neutral oil, like canola. Add the chicken pieces to the hot fat and sauté it. Turn the chicken after 4 or 5 minutes (when the first side is brown and no longer sticks to the pan) and continue browning. When the chicken pieces are totally browned, remove them and drain them on a paper towel. Once the chicken pieces reach room temperature, refrigerate them (you’ll be using the chicken later). Add the sausage to the Dutch oven/soup kettle, and sauté it until nicely browned (5 minutes or so). Remove the sausage and drain it on a paper towel. When the sausage reaches room temperature, refrigerate it (you’ll be using it later). While the chicken and sausage are browning, finish preparing the “trinity” (Step 6) if you haven’t already completed it. Also, peel the garlic and either mince it or cut it into thin slices. After you finish browning the chicken and sausage, pour the bacon fat from the Dutch oven into a measuring cup. Add neutral oil to the bacon fat until you have 1 cup. Pour the fact back into the Dutch oven, and heat it until it shimmers (a minute or two). When the oil is hot, add the flour all at once. With a whisk or a wooden spoon (preferably a flat-edged one), stir constantly for the first 2 or 3 minutes. Reduce the heat until the mixture bubbles nicely, then continue stirring every minute or two (stir often enough so you don’t scorch the flour; if you do, you’ll have to start over). Cook until the roux is the shade of peanut butter (usually about 35 to 45 minutes). It’s possible to cook the roux to an even darker shade; see Notes. When the roux is cooked, add the diced onions, celery, and green pepper. Cook the veggies until soft (at least 5 minutes, usually more like 10). About 2 minutes before the trinity is done, add the garlic. While the diced onions, celery, and green pepper are cooking, heat the chicken stock (in a separate pan) until it’s simmering. Once the diced onions, celery, and green pepper are cooked—and while stirring the roux/trinity mixture with a wooden spoon—add a large ladle of hot chicken stock to the pot. Stir vigorously to incorporate the stock. Continue adding stock by the ladleful until you’ve used it all. Add the diced tomatoes and stir to incorporate. If the gumbo seems too thick, you can add some water at this point. Add the Worcestershire sauce and 1 teaspoon of Cajun seasoning. Add the chicken (from Step 8), bring the mixture to a simmer, and set a timer for 1 hour. At the hour mark, add the okra slices (just add them frozen if you’re not using fresh okra) and the sausage from Step 9. Add more water if the mixture is too thick. Taste, and add salt and more Cajun seasoning if necessary. Continue cooking at a simmer for at least another hour (up to 3 hours total). About half an hour before serving, prepare rice (in the quantity you need) according to the package directions. Before serving the gumbo, add the reserved bacon pieces (from Step 7) and stir them into the gumbo (alternatively, you can nuke the bacon pieces in the microwave to warm them, then sprinkle them on top as a garnish). 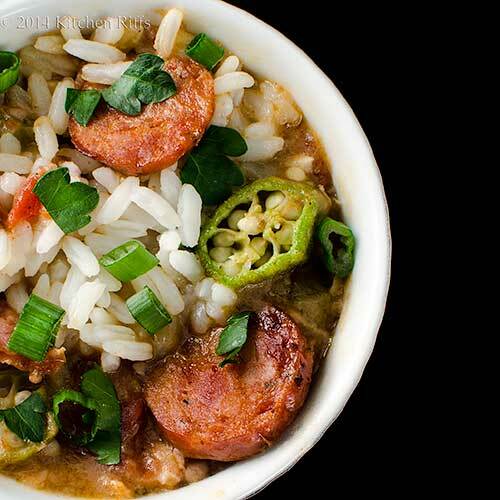 To serve the gumbo, add a scoop of rice to the center of a soup bowl. Ladle the gumbo around it, then garnish with sliced scallions and/or chopped parsley. I usually put hot sauce on the table (Tabasco and Crystal are two traditional Louisiana brands) that people can add if they want a spicier gumbo. What’s the difference between Cajun and Creole cuisine? Well, Cajun tends to be more “down home” country cooking, while Creole features more urban, fancified fare. Cajun food was developed by French settlers who left the Acadia region of Canada to settle in southern Louisiana. Creole food was developed by French settlers who migrated to Louisiana (particularly New Orleans) directly from France. Cajun recipes typically don’t include tomatoes in dishes like gumbo or jambalaya, while Creole recipes often do. But for most of us, both styles of food taste pretty similar, so call them what you will. If you don’t want to make your own Cajun/Creole spice mix, you can buy a commercial one like Tony Chachere’s. Be aware that most commercial blends (all of the ones I’ve seen, at least) contain a lot of salt. My recipe for Cajun seasoning makes more than you’ll be using for this recipe. Just store the extra in an airtight container and it should remain tasty for a couple of months (even longer if you stash it in the freezer). I like to use boneless chicken thighs when I make this dish because dark meat is more flavorful, and boneless cuts are convenient to use. However, bone-on meat is even more tasty, so use that if you wish. Just brown the chicken as directed in the recipe, and add it to the pot in Step 17. Then remove the chicken from the pot in Step 18 (when you add the okra and sausage). Let the chicken cool, then pull the meat from the bones. Chop the meat coarsely and return it to the cooking pot. If you’re not a fan of dark meat, you can substitute boneless chicken breasts. They won’t provide quite the same depth of flavor, but the gumbo will still be wonderful. Andouille is a spicy Louisiana sausage that’s flavored with garlic. It’s traditionally made with pork, although I’ve seen some good ones that include a bit of beef. In the US, several “name” brands are available nationwide—but none of them are worth buying, IMO. Instead, I recommend looking for locally made andouille. Even better, look for a brand that’s made in Louisiana (though this may not be an option in some parts of the country). If you can’t find a decent andouille, you can substitute good-quality kielbasa or another spicy smoked sausage. Some notes on roux: As discussed above, the longer you cook roux, the darker and more flavorful it becomes. Most people like roux when it reaches the “peanut butter” stage. It’s also easier to make this way, so I suggest going with “PB roux” the first time you make gumbo. But you may prefer the flavor of roux that’s been cooked longer, so feel free to experiment. You can make roux ahead of time, and then use it when you’re ready to cook the gumbo (just store it in an airtight container in the refrigerator). You can also make roux in the oven, though I haven’t tried doing it this way. Here’s a standard oven-based recipe: Heat the oil on the stove top, add the flour, then whisk madly for a couple of minutes. Remove the mixture from the heat, stirring to cool it a bit. Then place it in an oven that’s been preheated to 350 degrees F, and cook for 2 hours. Sounds easy—I definitely need to try this sometime. Unless you’re making gumbo during the summer months, the fresh okra you find in the market may not be very flavorful. So I generally use frozen okra. Its flavor is good, and you can buy it already sliced. If you don’t like okra, you can omit this ingredient altogether. If you’re thinking about skipping the okra, be aware that it helps thicken the gumbo. Without okra, you may need to cook the gumbo longer to achieve the consistency you prefer. You can also use filé powder to thicken the gumbo. Filé powder is made from the leaves of the sassafras tree that have been dried and ground. Many (though not all) supermarkets carry it, or you can order it online. To use filé powder, just place some in a small bowl and let diners sprinkle it on their gumbo at table. Start with just a little bit—that’s usually all you need (and it’s easy enough to add more later). Most people don’t use both okra and filé powder; it’s an either/or thing. “How about pairing with a Vieux Carré?” I said. Is Mardi Gras really already this Tuesday? I LOVE Gumbo, perfect way to celebrate! Great photos, too. Oh My! I want to grab that plate of gumbo right away! Delicious post. Hi Kristy, time flies, doesn't it? But yup, it's Tuesday. Thanks for the comment. 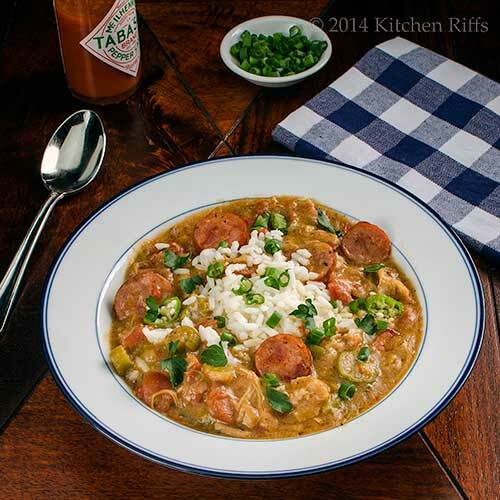 Hi easyfoodsmith, this is a terrific gumbo. I need to make some more! Thanks for the comment. Hi John , I know the gumbo is delicious , pass me a bowl ;-D , We started celebrating Mardi Gras in February and will be sad to see it go . But down here we always find a reason to celebrate . You are right John, okra / file /roux is the finishing touches to the gumbo .Down here we say to throw everything in the pot ... except the kitchen sink . Tahnks so much for sharing this wonderful recipe :). Hi Nee, I really should look at your gumbo recipes -- you're the expert on this sort of food! Thanks for the comment. As we are about to be snowed/iced in, I should have gotten gumbo ingredients at the store this morning. Doh! Maybe before Tuesday I can get them. You have made me extremely hungry for this! John, what a perfect dish for Mardi Gras! I've yet to taste gumbo, this looks delicious! Great recipe, love the spice mix. Thanks! I have not planned anything festive for this upcoming NO week celebration. And this looks soooooo good. Really nice photos. John: I visited NOLA a couple of years ago and fell in love with its cuisine. Your gumbo looks absolutely superb...I am so sharing it!!!! Hi Alex, isn't this nice? It does take time, but it's so worth it! Thanks for the comment. Hi Debra, sorry about that hunger thing. ;-) We're snowed in today -- light snow all day with loads of sleet. Not fun. Thanks for the comment. Hi Nazneen, you can easily leave out the sausage in this dish -- just add a bit more chicken. And you need to try your hand at making an étouffée sometimes -- they're wonderful! Thanks for the comment. Hi Lizzy, isn't that spice mix nice? And the gumbo is even better! ;-) Thanks for the comment. Hi Lea Ann, still time to make this. ;-) If not this week, sometime while the weather is still cold (it's so hearty that I don't find it that attractive when the weather turns hot). Thanks for the comment. Hi Denise, NOLA is such a great place, isn't it? Terrific food. Thanks for the comment. I haven't had a good bowl of Gumbo in years! I remember my first experience using filé powder. I laugh about it now but it sure wasn't funny went it happen. I put way to much in the gumbo and it thickened up like lava! This looks so good; I've been getting by with some very minimalist foods and I must be getting better when I see a photo like this and want to dive in, right? Forget Campbell's; this is Mmm Mmm Good! I have always, always wanted to try gumbo. I'm not sure if I'd like it, but I want to try it. This certainly looks wonderful! Hi Madonna, this is a terrific recipe -- I think you'll like it. Thanks for the pin, and comment. Hi Louise, the first time I used filé I had the same problem! Not as bad an experience as it sounds like yours was, but it was way too thick. That's why I now let everyone just add their own. Thanks for the comment. Hi Barb, great to hear your appetite is returning! You've been pretty sick, so that has to be a good sign, right? Thanks for the comment. Hi Laura, gumbo is really nice -- loads of fun flavors. It's definitely worth trying sometime to see if it's a dish for you. Thanks for the comment. I haven't eaten nor made a gumbo, but now I'm tempted to try. This is the sort of dish I love experimenting with on a Sunday because it's a leisurely day, perfect for getting that roux a nice dark color! Love it! Oh yes, gumbo so hot, so spicy it makes your eyes water and your glasses fog up. Now that's my kind of cooking and eating. I love using big shrimp for this dish, and I swear, the leftovers for this taste ever better over homemade buttermilk biscuits! Amen! I can just taste that! Comfort food with a kick. Forget the beads, I'll take that instead for Mardi Gras. Hi Barbara, you've still got plenty of cold weather, so this is a great dish for chasing away winter blues! Thanks for the comment. Hi Dawn, seafood is so good in gumbo! Although I love this chicken and andouille gumbo, I'm really torn between it and a shrimp or crayfish gumbo. I should make both! Thanks for the comment. 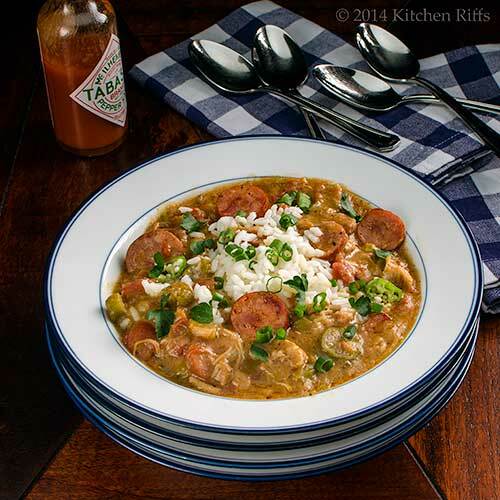 Hi Carolyn, the beads are fun, but this gumbo is even more fun! Thanks for the comment. I would do just about anything for a giant bowl of this right now! I adore gumbo ... and this one looks perfect! Well you know I like gumbo and your version sounds great. I agree that serving filé at the table is best as it is very hard to reheat gumbo with filé in it without it getting ropey. Hi Kimberly, we're certainly having gumbo weather at the moment! Nothing better than a nice warming bowl of this when the weather is nasty outside. Thanks for the comment. Hi Karen, isn't gumbo great? And you make an excellent point that reheating gumbo with filé in it is difficult. Thanks for your comment. Your gumbo looks terrific!!! Thanks for all the tips...as I've only made it once and you've put me in the mood for another batch. To me, gumbo is a very Southern American food to cook. You have cooked yours extremely well. Your rice look so fluffy accompanied with flavorsome ingredients. Very homely!!! Bobby has been talking about making a gumbo all winter. I should send him your post for some inspiration. What a great looking gumbo!!! How can you go wrong with a long-cooked roux and andouille sausage? :) Wish I had a bowl of this right now John! Laissez Les Bon Temps Roulez! I am a big fan when it comes to gumbo Your recipe sounds yummy. The chicken and andouille sausage sounds like a great combination. Hi Liz, gumbo is good stuff! I don't make it often, but when I do, I like to do it right. Perfect for the blustery weather we're currently experiencing! Thanks for the comment. Hi Zoe, this is a down home dish, isn't it? And it has such great flavor! Thanks for the comment. Hi MJ, time for Bobby to get on it! Laissez Let Bon Temps Roulex, indeed! Thanks for the comment. Hi Dawn, chicken and andouille is a magical combo! Although any kind of gumbo is pretty good in my book. Thanks for the comment. Hi Rocquie, beer is actually an excellent beverage to drink with gumbo. I haven't had a Dixie in years! Need to find a source. Happy Mardi Gras to you, and thanks for the comment. I have heard a lot about Gumbos but never eaten one. This looks well worth trying. I am intrigued by the idea of a slow cooked roux and the balance between great flavour and burning it. Hi Suzanne, that balance between great flavor and burning the roux does can cause problems! Although after the first few minutes, if you check in on it every couple of minutes -- and assuming you have your stovetop heat well regulated -- you shouldn't have problems. Thanks for the comment. Fantastic! This highly flavorful and comforting gumbo must taste amazing. Ahhhh, all I need now is a crusty piece of bread and a spoon and I'm set! You are right, the patience with the roux offers great reward -- so good! Hi Rosa, it really is an amazing dish -- super flavor. Thanks for the comment. Hi Charlie, you definitely can find gumbo recipes that include both meat and seafood, and they've become much more common lately than they were say 30 years ago. This is definitely the sort of dish I think you'd enjoy trying -- tons of flavor. Thanks for the comment. Hi Judy, isn't this such good stuff? I love the flavor of a long-cooked roux! Thanks for the comment. Hi Ray, gumbo is such lovely stuff! Loads of flavor, and just so soothing to eat. I love it! Thanks for the comment. WOW!! Now how tempting can food get? That looks wonderful! Hi Adri, this is such a great dish! Loads of flavor. ;-) Thanks for the comment. What a great looking gumbo. there is a funny story about gumbo. We were invited a dinner in our early days in America, and were served gumbo. Not used to one pot meal served in a dish during dinner by hosts, we took it to be the soup and hence the first course and ate accordingly. Then kept waiting for the entre, which of course never came, lol! That was when we learned more about this dish. The flavors look amazing! I always thought Creole and Cajun were one and the same - thank you for enlightening me! This gumbo sounds fantastic - well worth the 1.5-2 hours invested in it! Hi Minnie, gumbo sometimes is served in smaller portions as a hearty soup before a main dish. But it's more typically a meal in itself, as you found out. Funny story, although at the time you must have been mystified! Thanks for the comment. Hi Shashi, the difference between Creole and Cajun is a bit mystifying, isn't it? And this dish is so worth the time it takes to make! Thanks for the comment. There is nothing like really good Gumbo! This one looks fantastic and reminds me traditional New Orleans food. John, this gumbo has me drooling! (Granted, I just finished an Insanity workout this morning so all food looks great, but this looks mmm-mazing.) When we were in Louisiana, we definitely had some gumbo, but I'll be honest: I wasn't a huge fan. But I think making it at home and being able to tweak-to-taste will be great. I simply adore gumbo, and your looks fantastic! There is something about cajun food that is comforting to my stomach. Maybe I am so used to the spices. Thanks for the recipe. I will surely try yours when I am in the mood of gumbo. Hi Alyssa, gumbo can be so great, can't it? And this is a good one! Thanks for the comment. Hi Ala, always happy when my food has you drooling! Unfortunately there's some not-so-good gumbo out there, but this isn't it. ;-) Thanks for the comment. Hi Holly, Cajun/Creole food usually is kinda spicy, which I like too. This recipe isn't all that hot, spice-wise, but that's pretty easy to remedy when you make it. ;-) Thanks for the comment. Hi Greg, I know some people find the difference between the two intuitive, but not me! But I don't care, really, which is which, as long as it's good. ;-) Thanks for the comment. I was recently asked to attend a Mardi Gras party. This will be what I'll make! Looks so good John! Hi Monet, this would be a perfect choice for the party! Have fun. ;-) Thanks for the comment. that sausage is to die for! yum! Hi Kristi, glad you like those conversations -- they're so much fun to write! And this dish does take a bit of time, doesn't it? ;-) Thanks for the comment. Hi Sarah & Arkadi, andouille is such good stuff! And it's excellent in this dish. Thanks for the comment. John, I have just written down the supplies I need to make this super fantastic recipe this weekend. My boys are just going to love this. Hot and spicy and flavorful and made with lots of love. Who cares if it tastes long to make but tastes this good. A gumbo is how my very southern friend from Louisiana got me hooked to Southern food. She made a pot of it for our book club and I couldn't stop eating. Now I must make this for her and see what she says. Hi Bam, your boys are going to totally love this. You may even have a shot at filling them up with this! ;-) Enjoy. Thanks for the comment. Hi Bam, got it, and will reply in a minute. Thanks! Hi Ansh, isn't gumbo great? One of the things I love about gumbo is there are so many different versions out there. Hope you enjoy this! Thanks for the comment. Hi Padaek, if you really like okra, you can add even more. In that case I'd add it maybe 45 minutes before you plan to serve (because okra does thicken the gumbo; but if you get it too thick, no big deal -- just add some water). Thanks for the comment. Awesome recipe Karen! Just in time for FAT Tuesday :D Totally want to make this in honor. Never had gumbo before...my head is slowly lowering because just thinking that seems shameful. What better day to try it than today? Thanks for sharing!! Hi Kelly, actually it's John. ;-) You definitely need to try gumbo sometime, and as you say, there's no better day than today! Thanks for the comment. Southern kitchen has a well deserved reputation as one of the great world kitchen and your recipe proves it! I've never tried gumbo before but I will cook this one and if I'm not very mistaken this is going to be one of our family favorites. Hi Daniela, you have a treat in store for you! Gumbo is such a wonderful dish. Enjoy! And thanks for the comment. Hi Caroline, it is, is is! ;-) Thanks for the comment. 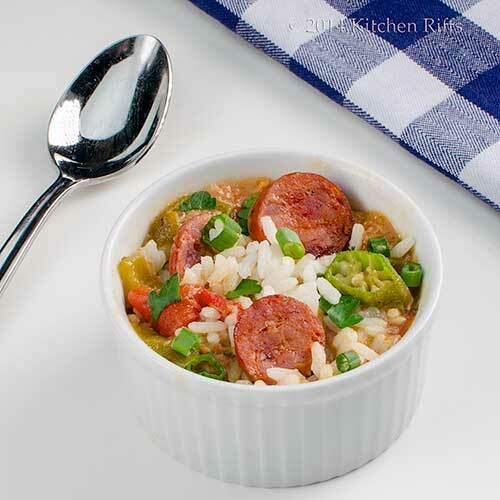 This gumbo would be the perfect dinner companion on this chilly night! Hi Pamela, this cold weather is getting old, isn't it? But this gumbo never gets old! Thanks for the comment. Hi Rosita, this really is such good stuff! Totally delish. ;-) Thanks for the comment. This looks spectacular John. I could really go for a big old bowl of this right now. That dish looks so good. The amount it makes is incredible but how cool to freeze it and have it a few more times with no mess no waiting. Hi Kim, it's really tasty. Great for your kind of weather, too. Thanks for the comment. Hi Maureen, this really does make a ton. So we usually make it when we're having company, send leftovers home with them, and still have some for ourselves! Thanks for the comment. I've always assumed about the similarities between creole and cajun -- thanks for enlightening!! Hi Kiran, isn't gumbo so good? It's my comfort food, too! Thanks for the comment. I don't see anything wrong with mixing the two ;) And your gumbo looks quite delicious! Hi Kristi, I've been known to mix the two before! ;-) Thanks for the comment. I had no idea the difference between Cajan and Creole. I kind of thought it's similar thing and didn't know the history behind. Your gumbo looks so delicious! I hope to celebrate next year! Hi Nami, I must admit most of the distinctions between Cajun and Creole are lost on me. It's all good! Thanks for the comment. Hi Raymund, it's a great dish! Enjoy. Thanks for the comment. Hi Terra, jambalaya is good stuff! I need to make some one of these days. You won't be sorry with this gumbo -- it's really nice. Thanks for the comment. John your gumbo looks amazing!! I LOVE GUMBO! I'm definitely going to be craving this dish now. I need to buy some andouille! Hi Amy, andouille has such great flavor, doesn't it? As does this gumbo! Definitely worth making. ;-) Thanks for the comment. Somehow I missed this John and just saw it in my Bloglovin. It looks just wonderful. We really enjoy gumbo, it's probably in our top ten favorite dishes. I love that there are so many versions. this one sounds fabulous! Hi Chris, there really are almost countless versions of gumbo, and I've run into very few that I didn't like. But this is one of the better ones, IMO. ;-) Thanks for the comment. Wow, 21 steps to make this dish, but it looks like it is worth it! I didn't know the difference between Cajun and Creole cooking- your info was very helpful! Hi Fran, a bunch of these are baby steps. ;-) It does take time to make this dish, but it's awfully good! Thanks for the comment. I love this, the combination of chicken and the sausage. And interesting too. Thank you for sharing and teaching me new things! Hi KB, this is really a great dish! Tons of flavor -- and so satisfying. Thanks for the comment. Hi Hannah, it's been warm here lately, but I'm with you that stews still beckon! Thanks for the comment. Hi Candy, I'm drooling as I think about how good this was! ;-) Thanks for the comment. Your recipe is amazing! I appreciate all the time and effort you put into it. The spice blend you used will be a good reference for me next time I want to do Cajun, and thanks for the note about having to compensate with more cooking time if I cut out the okra. I'm not too fond of okra but this dish looks soooo appetizing! Hi Mireya, isn't this a great recipe! I love a good gumbo, and this is good gumbo. ;-) That spice mix is dynamite. Thanks for the comment. I have only ever made gumbo once but I loved it!! This recipe looks so hearty and delicious! Hi Julie, isn't gumbo good stuff? I love it too! And this version is particularly nice. ;-) Thanks for the comment. I went to college in south Mississippi so I spent a great deal of time in New Orleans. I also had close relatives that lived in south Louisiana so I've eaten a lot of gumbo in my day. This recipe looks mouthwatering and has me wanting to make a big pot right now!. Great post, John! Hi Bill, it's quite chilly again here (again!) so gumbo sounds pretty appealing. Real comfort food! Thanks for the comment. Want to make gumbo for the first time ever, and was wondering if the bacon is an important step? If it is, is turkey bacon also acceptable? Hi Anonymous, you can skip the bacon if you want -- it does add flavor, but this dish is already pretty flavorful, so it won't be missed much. I've never made it with turkey bacon, but I don't see why it couldn't be made that way. Thanks for the question. Amazing! This is simmering on the stove and I'm making corn muffins and rice to go with it. Might be too spicy for my husband but I can't wait! Hi Anonymous, glad you like it! And if it's too spicy for your husband, he can just eat more rice. And corn muffins. ;-) Thanks for the comment.